For more insight into which version of the 3-month plan is right for you, take the Magoosh Diagnostic Test. 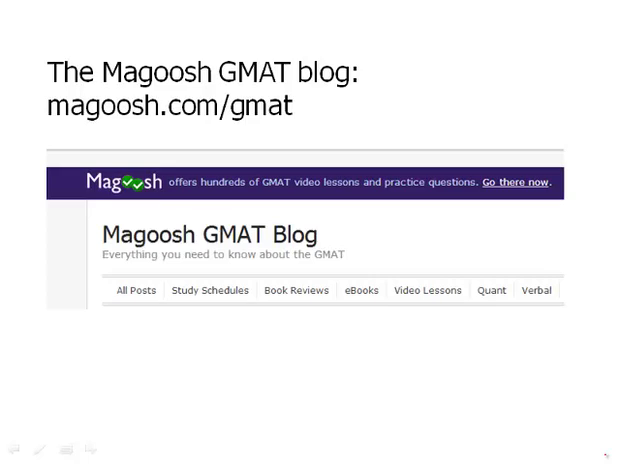 This is a video summarizing Magoosh's study plans and its resources to help you on the GMAT. Magoosh has several resources to support your GMAT success, and we want to make sure you know all about them. So the first thing I'll say is, that this is funny because people come to Magoosh in several different ways. And so some people find one of the resources and then come to the product. Other people come to the product another way. They have no idea about the resource that the first person found. So we wanna make sure that everyone understands all these things. So first of all, many of these are found on the blog. So, if you, this bar right here is inside the Magoosh product. It should look familiar. Your dashboard or anywhere else in your product, you'll see this bar. And if you click on this link right here, Blog, that will take you to the Magoosh Blog. You go to the blog, well, then you'll find all these resources. Now, right away I'll say, many people already know about the blog. In fact, that is how they found out about Magoosh, but of course, there are some people who find out Magoosh through another channel. They have absolutely no idea that Magoosh has a blog. So if you don't know that we have a blog, you definitely should check it out. Now first thing, I'll say about the blog is, it is packed with articles covering all kinds of points of GMAT content and, and strategy. If you read everything on that blog, you would be a GMAT expert. You would be fan, in fantastic shape for the test. I'll point out that we have book reviews on this blog that can help you. We have eBooks, especially the Idiom eBook which is very helpful. There are some video lessons and, of course, lots of stuff about content, but this is the one I'll point out here. You can get to the study schedules from this bar, also on the page, if you go further down on the right side of the page there'll be a list of the study schedules. You can find that on the blog also. So what study schedules do we have here? Well, here's a list of the study schedules that we have posted on the blog. First of all, if you have only one month to go until your GMAT, we have two options. There's the one month daily plan where everything is spelled out day by day. Do this on Monday, do this on Tuesday, that sort of thing. There's also a weekly plan for people who just wanna keep it loose. Okay, in one week I have to cover this. There are four, three-month plans, one of them just for beginners, people who are intimidated by math, intimidated by verbal, they're just starting out, they feel like they want help in everything. The second plan, is for people who are strong in verbal, but weak in math. Maybe they majored in something verbal in college, they haven't touched math in a while. They really need boosting on math. The next one is for people who are strong in math, but weak in verbal and this is an ideal plan, for folks who are coming to Magoosh, who know English as a second language. This, this is really the plan that will support these people. And finally, an advanced plan, there are some people, they already feel good in math. They already feel good in verbal, but they really are aiming for an elite score, the advanced plan is the one to follow. We also have the six-month plan for people who are really taking an, a tremendously long time to prepare for the GMAT. That is wonderful if you give yourself that kind of opportunity to study that long for the GMAT. For more resources, just follow the links below this video.